Do you enjoy wearing your affirmations on your wrist? 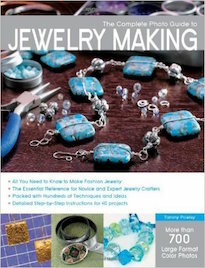 Lisa's thinking about using shrinky dinks in jewelry to create "shrink-firmations"! About.com Jewelry Making Tammy has a few new projects incorporating pewter, a perfect substitute for silver. Art Bead Scene Art Bead Scene gets down to business and talks about loss leaders. Beading Arts Cyndi just finished a 45 hour project that reused antique steel cut seed beads...and some steel buttons! 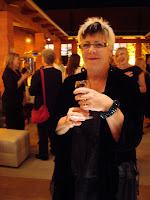 Carmi's Art/Life World Carmi takes classes with Swarovski Elements Ambassadors and finally learns how to crochet. Cindy Gimbrone, The Lampwork Diva It's fall and along with it comes a gray sky in the form of jewelry. Earthenwood Studio Chronicles Rotting veggies and over ripe fruit makes for bead inspiration and a delicious muffin recipe! Lorelei's Blog: Inside the Studio A little antiquing adventure, and Lorelei's got some cool new props for an upcoming craft show! Snap out of it, Jean! There's beading to be done! Jean reviewed a unique and very beautiful book: Metal Clay Origami Jewelry, by Sarah Jayne Cole. Please come and see the review on Jean's blog! 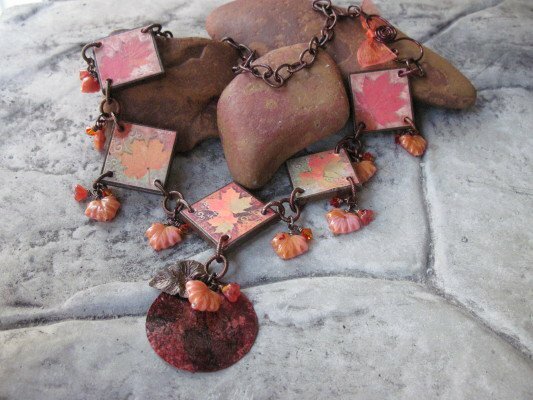 The Writing and Art of Andrew Thornton Beadaholique has generously donated a leafy assortment of autumn-inspired beads and components. Find out how you can win this Thursday Giveaway! We had a fairly mellow Halloween. 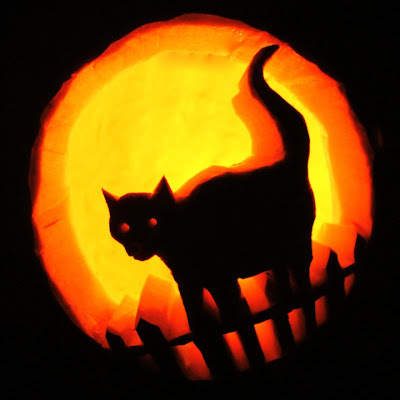 To celebrate the holiday, we carved the giant pumpkin from our garden. It was a toss up between an owl design and a cat one. The cat won out. I went at it old school style with a kitchen knife. Towards the end, it dawned on me that I have power tools and I broke out the drill for the eyes. The end result reminds me of Paulo. We sprinkled the inside cap with ground cinnamon, nutmeg and cloves. Basically pumpkin pie spices. When the candle inside is lit up, it smells like a pumpkin pie is baking. I'll reserve that task for tomorrow after my trip to the hospital. Paulo sitting on the giant pumpkin from our garden. Cenya has yet again rallied the troops AKA the Etsy Beadweavers Team to create a stunning Treasury called, Pay It Forward. These talented artisans have generously donated pieces to help raise funds to combat my growing medical bills. I am humbled by their kindness and willingness to help. I really can't describe how grateful I am to them for their support! This is an awesome display of talents. Treat yourself to a work of art or get the perfect holiday gift for someone you love. The Etsy Beadweavers Team has put together some fantastic pieces. Even if you can't acquire anything at this time, please stop by the Treasury and leave a comment. (I'm told that the page views and comments help keep the Treasury prominently displayed.) CLICK HERE to visit the Pay It Forward Treasury on Etsy. 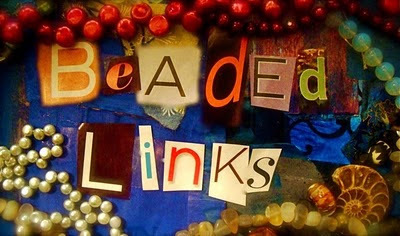 Don't forget to swing by Cenya's blog by CLICKING HERE and the Etsy Beadweavers Team blog by CLICKING HERE for more exciting examples of beadwoven jewelry. Heather Powers of Humble Beads is one awesome person. 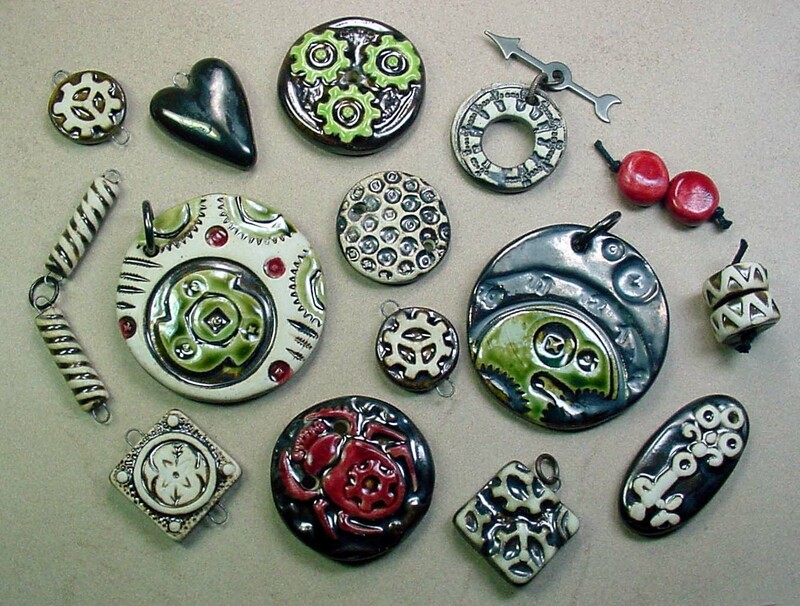 She's supremely talented, innovative, and constantly making unique polymer clay components. She's also very generous. She has donated her "Seek Wisdom Necklace" (and matching earrings) which appeared in the latest issue of Bead Trends magazine to be auctioned off to help with my medical bills. Isn't she a darling? To find out more about the pieces and how you can get ahold of them CLICK HERE. Don't forget to check out her Etsy shop and her blog to see even more examples of her work! Whenever I get stuck, I find myself in the kitchen. Sometimes the simple acts of preparing a meal can unlock the obstacles. There's something freeing about setting to a task and just allowing your hands to move of their own accord. Cooking engages the senses. Sight. Smell. Taste. Touch. They combine to produce something that will nourish both the body and the soul. Today has been a great big flop as far as getting things done. I needed to achieve some small act. I needed something to combat the darkness, creeping in earlier and earlier each day. I needed a bowl of chicken soup. Meanwhile, I pulled the chicken into smaller bite-sized pieces and tossed with a tablespoon of olive oil. I then coated the chicken in melody of seasonings. I used garlic powder, onion powder, smoked paprika, cayenne pepper, ground red pepper, salt, ground black pepper and a dash of curry powder. This is set aside so that the chicken can absorb all the flavors. In a large pot, I melted down two pads of butter and added a dash of olive oil. To the oil and butter mixture, I added a few spoonfuls of minced garlic and two big hunks of peeled and slivered fresh ginger root. The ginger really turns up the heat in this soup. Move the ginger and garlic around on medium heat for about five minutes or until the edges of the garlic start to turn golden. Add a cup of white wine. Pour in the roasted carrots, onions, and celery. Coat the vegetables in the garlic, ginger wine mixture. Strain stock and add to the vegetables. You'll want to cook this down until the stock has thickened and the vegetables are completely soft. This takes about 30 minutes. Once the soup based has thickened, add the chicken. It's important to add the chicken last. Since it's already cooked, it just needed to be heated up. Cooking it for much longer will make the chicken dry and rob it of the flavors it has been soaking up. So don't overcook! The soup should be quite thick at this point and VERY spicy! Prepare your bowls by filling them halfway with room-temperature creamy coconut milk. The coconut milk will help sweeten the dish and balance the heat of the spices and ginger. The coconut milk will also add liquid and make it more soupy and less stewy. I like to serve this Asian-inspired chicken soup with lots of sliced baguette bread on the side to sop up whatever the spoon misses. The bowls are guaranteed to come back clean. When I woke up this morning, I had fantasies of plowing through all the tasks and deadlines that had accumulated. The sun has long since set and it is well into the evening and I find very little has been marked off my list. Even though I'm recovering quickly from surgery and am getting better every day, I just can't seem to find my stride. Simple things that I used to do without even thinking just seem so exhausting now. I feel a little wobbly, like my equilibrium is off... which very well may be true since they did remove a large portion of my flank. I don't know. I feel like I'm at a standstill, like things have piled up impossibly high. This week, one lucky winner will take home this treasure trove of goodies courtesy of Beadaholique! Aren't they generous? This is one incredible prize! 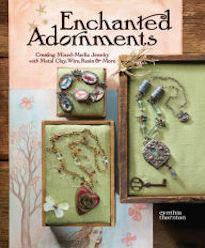 Up for grabs is an assortment of beads and jewelry-making supplies that were inspired by autumn. I love all the rich, earthy colors. Make sure to swing by to check out these leafy components and other great deals available at Beadaholique. Since there is quite a lot, I decided to break it down a bit. I think it shows just what an awesome prize this is! 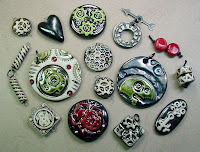 The Beadaholique crew included some colored filigree stampings from Ezel Designs. They are lightweight and can easily be layered like I did in these earrings. Use them to frame and accentuate another component or let them stand alone. Carved stone leaves add a little bit of luxury to any design. I marveled at this assortment, mixing and matching them to create different effects. Some could be used as pendants, others could be turned into sumptuous bracelet and earring designs. Beadaholique also included some really interesting metal components like leafy bails, toggles, plated leaves, and some Vintaj natural brass. 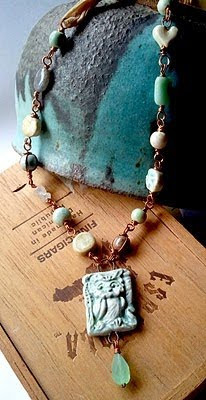 The oxidized chain is one of my favorites. I love the little metal and glass locket. It's perfect for putting an actual autumn leaf in to wear. The Beadaholique team included silk ribbons and cord. The silk is soft, colorful and deceptively strong. These would be perfect in designs submitted to the fibers-oriented book Lorelei Eurto and Erin Siegel are cooking up called, A Jewelry Accord. To win all these lovely goodies pictured above, all you have to do is leave a comment on this blog post. It's that easy! One lucky winner will be randomly selected from the comment section of this post on Monday (November 1st) at midnight EST. Please leave your name and contact information if it doesn't already appear next to your comment. This giveaway is open to all participants, including international readers! Bonus Points: Do you really want this assortment of autumn-inspired beads and components? If so, you can earn additional entries by blogging, updating your Facebook page, and/or Twittering about this Thursday Giveaway. Don't forget to add your act of social media kindness as a SEPARATE comment to this blog post for your extra chance to win these leafy lovelies. Extra Bonus Points: Swing by Beadaholique's blog, Strung Out: A Beader's Blog and find the Follow widget in the right sidebar. Become a Follower of the blog and report back here with a comment saying you have after the deed is done. CLICK HERE to go to their blog. You can earn an extra entry by also going to their Facebook fan page and liking it. Once you've successfully liked it, come back here and leave a comment saying you have. CLICK HERE to go to their Facebook fan page. Jenni took this picture with my camera. I quite like it. The image was snapped at the Beehive Coffeehouse on East Carson. We spent part of the rainy day in Pittsburgh at the cafe chatting and people watching before I had to deliver her to the airport. We puzzled over "Emish" (Emo + Amish) hipster fashions and her missionary plans to Southeast Asia while drinking coffee and mate lattes. I foresee many pots of coffee in the near future. So much has piled up. This pesky cancer thing has really thrown a wrench in things. I have over 200 unanswered emails. Many of them are flagged as important. If you're waiting for a response, I apologize, but will begin chipping away tomorrow with the aid of a freshly brewed pot of coffee. Yesterday I went to the hospital for the latest pathology report and for my staples to be finally removed. The doctor delivered some very good news... clear margins. This means that the area removed around the carcinoma were not infected with cancerous cells. Who would have thought that two words could be so beautiful? Another highlight was that the staples were taken out. The incision site is mending. A red scar, seven inches long runs along my side. The line is flanked on each side by a row of fourteen little red dots. Such a pretty little pattern. Sadly, my tango with the hospital is not over yet. One would think that after this elaborate dance done at such a frenzied pace, it'd be time to rest. Unfortunately the tests are not over and on Monday I'm scheduled for a PET scan, which happens to be a very expensive procedure. Apparently there is some concern over my age and the development of this particular cancer. It is commonly found in people twice my age with much higher sun exposure and histories of smoking. Then I have to meet with an ENT to examine my sinuses and lymph nodes. If the PET scan is clean and the ENT doesn't find anything and my follow up exams are clear... then I'll be out of the woods. This has definitely been a scary experience. The paperwork and money worries probably just as frightening, if not more so, than hearing that my body is rebelling against itself. I took that like a champ. Receiving the first bill... not so much. The love and support of the community has been of great comfort though. I really don't know what I would have done without it. I was on the verge of drowning and the kindness and generosity of others was a lifesaver. It's true that there's still a small mountain of medical debt to be tackled, but I feel much better about my situation and am very appreciative of all the efforts done on my behalf. The prospect of returning to some semblance of a regular life is hard to imagine at this point, but it glints like something shiny in the distance... waiting for me to find it. One of my best and dearest friends came up for the weekend. I've known Jenni since we were both in the 5th grade. She's seen me at my best and worst and all the awkward phases in between. When we're together, it's as though the clock rolls back and we're those dirty kids playing in the mud again. We laughed. We talked. We stayed up late into the night watching movies and playing games. We went for walks in the woods and explored the leaf-littered landscape. It was a balm that I didn't know I needed. The cancer diagnosis aged me a hundred years. This weekend gave me back those years that were taken in an instant. Of all the many hundreds of pictures taken throughout the long weekend, this is one of the few that I'm going to share. It's not for lack of quality material. Some really stunning images were captured. But I do not want to diminish the importance of this moment. For what seems like the first time in a long time, I exhaled. When I heard the cancer diagnosis, a breath hitched in my lungs. It wasn't a conscious thing. It was an involuntary instinct. I held it there and it held me up. I inflated myself with this battered breath. I walked around with it trapped in my chest, a silent source of terrible strength. I laid out on the table, as they cut me and cinched my flesh with staples, and still I held on to it hard. And in the days afterwards, worrying and fretting over bills and missed deadlines and unanswered emails and backlogged chores... I held it in until my chest seemed like it'd almost burst. And then I stood on what seemed like the top of the world and I let go. In the face of boundless beauty, I released the breath I had been holding tightly. We laughed and joked on our way back to the car, but I fell silent at times, marveling on what it was like to breathe again. 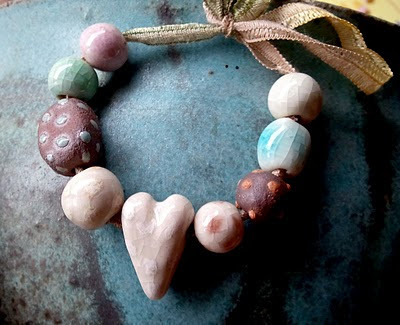 The winner for this past week's Thursday Giveaway is Mallory (Rosebud101) of For the Love of Beads. Please email me with your contact information and I'll put your prize in the post. Be on the look on Thursday for another chance to win! Need help embracing seasonal change? Lisa uses a bit of swarovski sparkle to make the leap! Tammy has a collection of crafting Halloween project ideas as well as an adorable monster pin for you. A free jewelry project by ABS Editor, Cindy Gimbrone. Barbe 's finally a Cover Girl! Carmi whips up a new necklace with a "Day of the Dead" theme. It's time to get educated and Cindy provides some stats along with rainbows. Check out the goodies Melanie found at an antique mall...What would you craft with these items that are full of history? 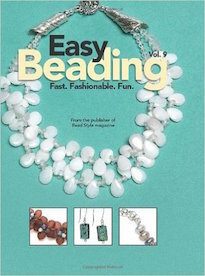 Lorelei is teaming up with designer Erin Siegel, to write their first beading book! Come on over and learn how you can sign up to submit work for the book! 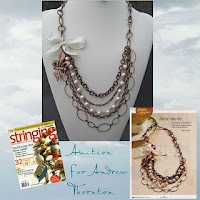 Jean has contributed a one of a kind jewelry piece which she made to help raise funds for Andrew Thornton's medical bills. She is delighted to help, on behalf of her family. Please come and see the piece and consider bidding. Thanks so much! Three of Andrew's necklaces are amongst the gorgeous finalists in Soft Flex Company's "Flex Your Creativity Beading Contest". 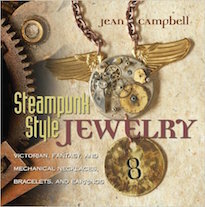 Check out all of the Steampunk-inspired designs and VOTE today! This week, one lucky winner will claim the prize of these glass beads by Faith Davis-Ferris (Faye) of The Quest Continues LLC. 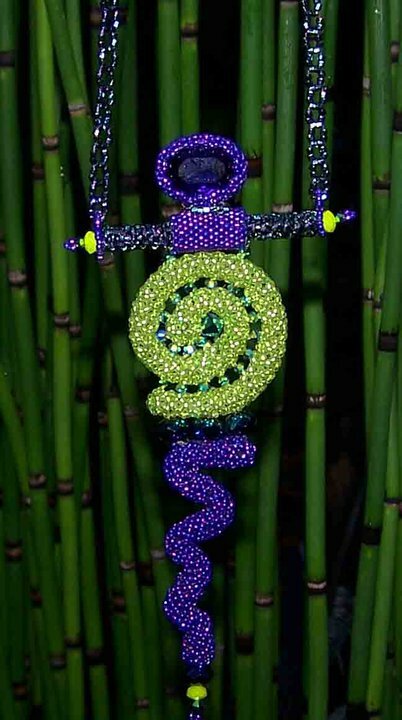 Up for grabs is a iridescent borosilicate glass bead focal and two of her sculptural beads – a swimming mermaid and a perched frog. One of the cool things about her sculptural pieces is that they are all done in one sitting. They are gestures, captured in glass. Their immediacy is made physical. The borosilicate is rainbow made solid. Faye is a magician at turning the ephemeral into something more permanent. Faye is also generously hosting TWO more giveaways in conjunction with this one! One can be found on her BLOG and the other is on her WEBSITE. That's three ways of winning! Be sure to swing by both to check out the beautiful glass prizes and to enter to win. To win these lovely glass beads pictured above, all you have to do is leave a comment on this blog post. It's that easy! One lucky winner will be randomly selected from the comment section of this post on Monday (October 25th) at midnight EST. Please leave your name and contact information if it doesn't already appear next to your comment. This giveaway is open to all participants, including international readers! Bonus Points: Do you really want this set of beautifully crafted glass beads? If so, you can earn additional entries by blogging, updating your Facebook page, and/or Twittering about this Thursday Giveaway. Don't forget to add your act of social media kindness as a SEPARATE comment to this blog post for your extra shot. Kim Van Antwerp is a very talented artist and such a sweet friend. It is always nice to see her at the big shows and hear of her recent adventures. Seeing her at the shows provides me with an opportunity to see what she's been making. Her work has a whimsical element; she creates pieces like cross-stitched Godzilla earrings, koi fish hearts and glass critters with clothes. I love her little glass birds. (I have an owl by her named Henry.) 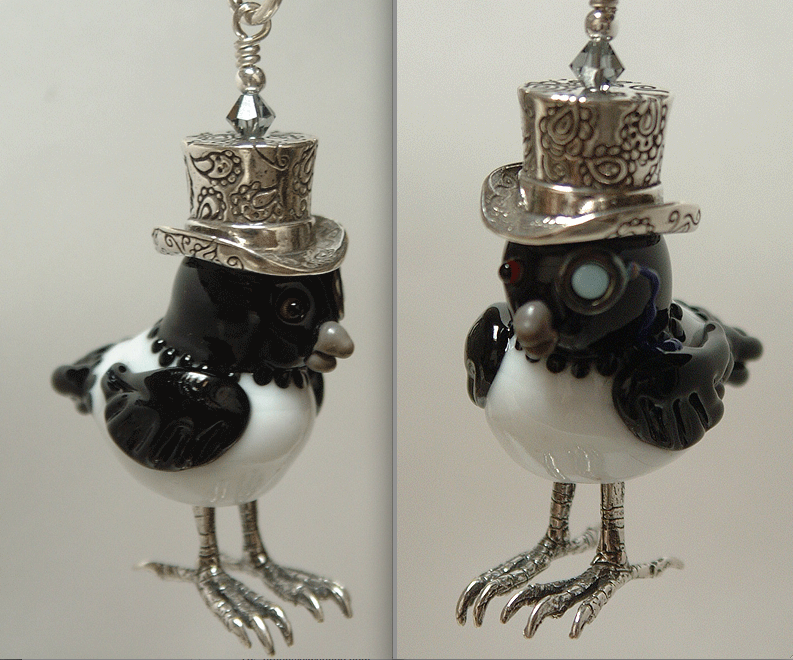 Kim has generously donated this monocle-wearing magpie to be auctioned off too help with my ever-increasing medical bills. I love his little silver top-hat and toes. Too cute! CLICK HERE to find out more and how you can bid to win this stylish feathered fellow. Jean Yates is a delightful friend who has always been supportive and encouraging of me and my work. Although we've never met in person, it feels as though we've known each other forever and have sat down for tea a hundred times. We've shared many highs and lows over the years and I feel lucky to call her friend. Jean is so sweet and put up this necklace to auction off to help raise money for my medical bills. Isn't it lovely? To find out more about the piece and how to bid to win, CLICK HERE. If you've picked up a recent copy of Jewelry Affaire or are a jewelry maker, then you surely know the work of Gaea Cannaday. I adore Gaea's work. Each of her pieces sing with poetry and her distinctive style. Gaea is also a very supportive friend, who has always been there for me. Right now, she's got three auctions up to help raise funds to alleviate my medical bills. Isn't she a darling? 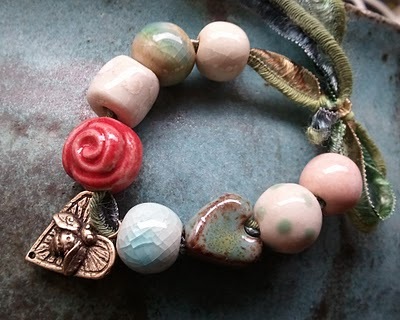 CLICK HERE to find out more and to bid on this beautiful bracelet featuring a bronze bee heart by Candice Wakumoto. CLICK HERE to find out more and to bid on this fantastic owl necklace. I've loved owls ever since I was a little boy and one flew over my head in our barn in the backyard. 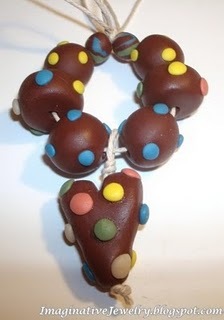 Aren't these spotted ceramic beads beautiful? I love their earthy, rustic appeal. CLICK HERE to find out more and to bid on them. Are you interested in a chuckle? Head on over to Juli Cannon's blog. I almost busted my staples laughing so hard. 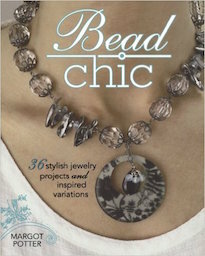 Juli is also a talented bead maker and created the sumptuous creations above. Don't they just glow? Not only is Juli talented and funny, but she's also generous. She's got an auction going featuring the above beads. 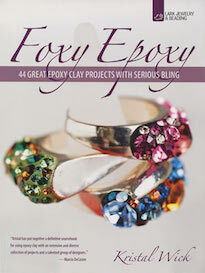 CLICK HERE to visit her blog and see how you can get ahold of these pretties. Melanie Brooks of Earthenwood Studio is one of those artists who is constantly evolving and creating fresh, new work. I'm always excited to see what she is making! She's also a good friend and has generously put up wholesale bundles of Steampunk-inspired components to aid in my medical bill relief. CLICK HERE to check out her website and peruse her ceramic goodies and CLICK HERE to find out more about the bundles and how you can get ahold of one. I had the pleasure of spending some time with Jeannette Cook, of Beady Eyed Women, last year in Tucson. We stayed up late into the night chatting away. She's a vibrant, caring person who is supremely talented. I admire her skill with needle, thread and beads. Her designs are as vibrant as she is. 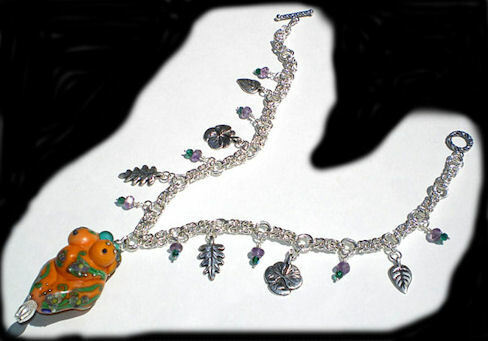 Jeannette has graciously put up for auction her necklace, "La Femme Spirit". Isn't it beautiful? Email her at BDIDWMN@aol.com to place your bid. 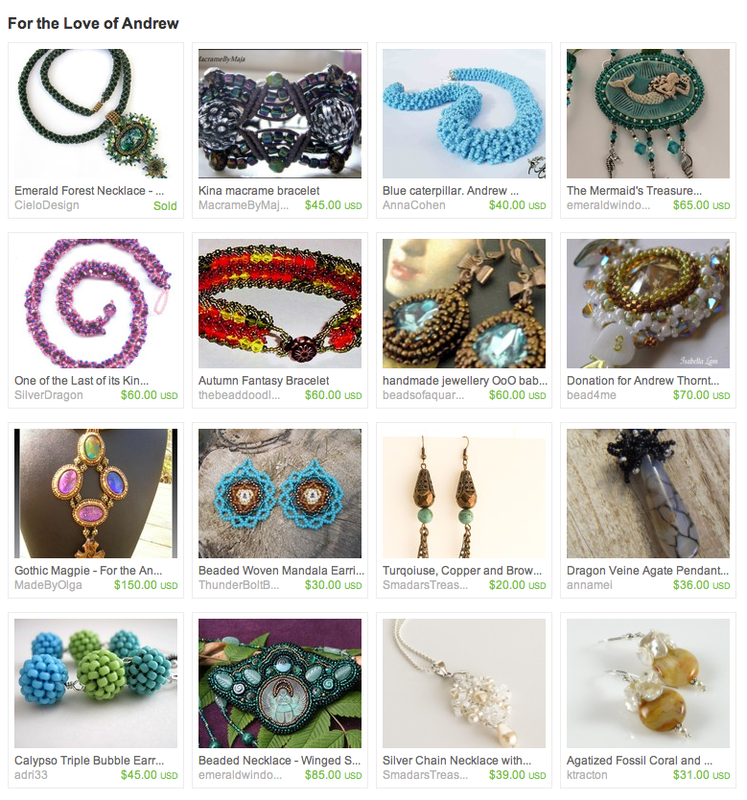 Cenya Eichengreen (aka Emerald Window), an amazing beader, cancer survivor and friend, mobilized the Etsy Beadweavers Team to create a Treasury filled with items to be sold off to help with my medical bills. Isn't she wonderful? I was absolutely floored by the generosity of everyone involved! The Treasury, For the Love of Andrew, is filled with stunning beadwork. I encourage you to check out the talent on display; there are some really beautiful works of art. CLICK HERE to visit the Treasury. Even if you can't purchase a piece, please stop by anyway and leave a comment to show your support. 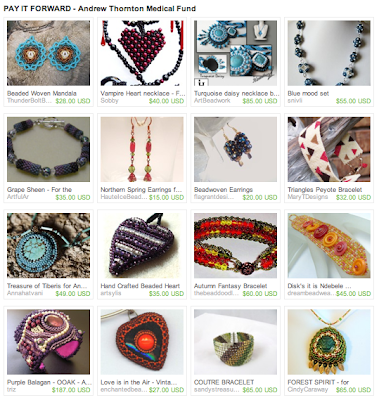 Don't forget to stop by Cenya's blog HERE and the Etsy Beadweaver Team blog HERE. Dot Lewallen has generously put "Snowball" up for auction to help raise funds for my ever-increasing medical bills. Dot has embellished this cute stuffed animal with intricate bead embroidery and sew-on crystals. I love her story of turning "Trash to Treasure" and how she rescued this feline from sure demise. To find out more about Dot and how you can win little Snowball, CLICK HERE. 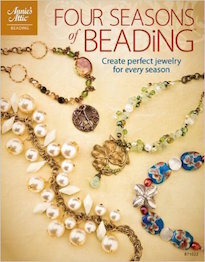 If you've strolled through your local bookstore lately, you've probably seen Marcia DeCoster's new book, Beaded Opulence, or seen her enchanting designs gracing the pages of Beadwork magazine. Marcia is a delightful person and is mega-talented. Her designs are posh and embody splendid elegance. Marcia is also very generous! She donated her recent Beadwork challenge piece to be auctioned off to raise money to combat my crazy medical bills. Isn't it beautiful? It's regal, just like Marcia! (Marcia rarely parts with her finished pieces, so this is a unique opportunity to get ahold of one of her masterpieces!) To find out more about the piece and how to bid, CLICK HERE. Joan and Lana of Off Center Productions are quite the creative duo! They constantly amaze me with their original and evocative ceramic designs. I am particularly smitten with their Global Connections line. I must admit that I hoard their work rabidly. They have generously donated this beautiful, hand-built stoneware box that Lana made to be auctioned off to help defray my rising medical expenses. To find out more and how you can bid to win this stunning piece, CLICK HERE. Did you see the Fall issue of Stringing magazine? 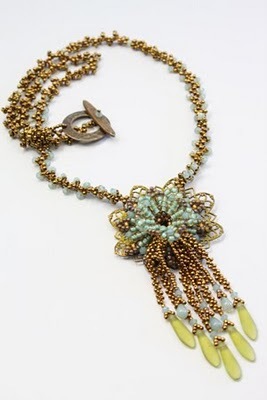 If you did, you probably noticed Kristy Abner's stunning necklace, "Fleur de lis". Isn't it lovely? She is such a sweetheart for offering up this fashionable piece in an auction to help aid in my mountainous medical bills. To find out more about her piece and how to bid, CLICK HERE. Last night, I laid uncomfortably contorted against propped up pillows waiting for sleep. My back ached. I stared into the dark, counting off seconds. I searched the darkness for slumber, for a way to cast off and drift away into dreams. I woke several times in the night with tack-sharp stings of pain. The tightly bound skin of my recent surgery would smart with every unconscious move of my body. I do not remember much of these interrupted dreams – just a bright, bleaching light and honey-colored stone. Half a dozen times, I found myself transported to and from this place of light and stone. And then finally the dream was allowed to play itself out. I was standing in the middle of a place I've never been before. All around me were people dressed in robes, speaking languages I did not understand. Waves of heat radiated against me. Sour smells mixed with sweet aromatic ones. Flanking me to my right and left were stone walls, the color of sand. It was hard to make too much out. The light stung my eyes. I navigated the bazaar of sun-browned faces and unfamiliar speech. I found a corridor lined with straw baskets and made my way down the cooler, shadowed path. At the end of it was a figure. My eyes strained to adjust to the shadows and I saw someone that was both stranger and recognizable. I saw my own face looking back at me. It wasn't MY face though. His was older. His was wiser. The set of his jaw different. His was one that had endured much and wore the evidence of it. And then I realized, that I was looking at my brother. I haven't seen my brother in twenty years. He told us he was leaving one afternoon and that he wasn't coming back. He disappeared from our lives completely. We do not know if he's alive or dead. The winner for this past week's Thursday Giveaway is Erin Strother of Studio E. Congrats! Please email me with your contact information and I'll put your prize in the post. Be on the look on Thursday for more opportunities to win! Aren't these lampwork glass bead focals lovely? Helga, a talented bead maker, has generously donated these beads to be auctioned off to help with my medical bills. Isn't she a sweetheart? To find out more about the auction, you can check out her new blog HERE. To bid, CLICK HERE. You can also see more examples of her work on her Flickr page, HERE. Jeni Smathers wanted to keep the wheel of Random Acts of Kindness turning by donating her creations she made for the Michael's Challenge. Isn't she thoughtful? We've never met in person, but she has been extremely kind. 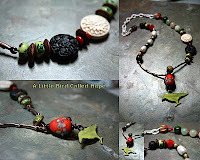 She is auctioning off her necklace and matching earrings to help defuse my medical expenses. 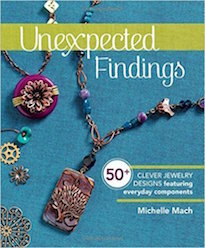 To find out more about the necklace and earrings, and how you can get ahold of them, CLICK HERE. Erin Prais-Hintz is a talented designer and friend. She is a constant source of inspiration and has generously donated her Michael's Challenge piece to auction off to raise funds to alleviate my medical bills. CLICK HERE to find out more about the piece and how to bid! I just wanted to let you all know that I've got three pieces up for consideration in the Soft Flex Company Flex Your Creativity Beading Contest. This year's theme was Steampunk! I am honored that my pieces are amongst several innovative and really beautiful designs. Please take a moment to check out the entries and vote. You can select up to three of your favorite designs. CLICK HERE to vote. Voting will last from October 15th through December 15th. If you've been tuning in lately, you'll have seen several auctions up to help defray the bills I've incurred since my cancer diagnosis. I feel blessed to be surrounded by so much positive energy and support. It is truly amazing and I am totally humbled by the response. There are others who are in need though who are less fortunate than I am. Lindsay of Fusion Beads recently contacted me with information about their 3rd annual jewelry auction. It'll be held on October 21st. I highly encourage anyone in Seattle or the near by area, to stop in and bid on the beautiful jewelry. The proceeds from the auction will go to Allie and her 6 year old son Eligh. Earlier this summer, Eligh had a golf ball sized tumor removed from his brain. Since his surgery, he has been hospitalized and is in rehabilitation, relearning to walk, smile, eat.... everything. His mother has left her job to care for her son full-time and to work with him to restore a semblance of the life he used to live. So, if you're in the area, please consider stopping out and showing your support for Allie, a member of the Fusion Beads family, and her son Eligh. Yelisa of Imaginative Jewelry was kind enough to compile a list of dear friends who are hosting auctions to help raise money for my mounting medical bills. I appreciate each and everyone of them and their efforts. THANK YOU! Yelisa is also auctioning off some of her polymer creations! You can CLICK HERE for the list of Random Acts of Kindness and to check out Yelisa's auctions! Marie Cramp of Skye Jewels is auctioning off a necklace to help with my medical bills. The necklace won the Vintaj Natural Brass Maple Glow challenge. I am deeply moved by her generosity. To find out more and to bid, CLICK HERE to visit her Facebook page. Inspired by the Fall 2010 Pantone Color Report, Andrew creates a necklace for Artbeads.com's Colors of Fall designer gallery.